In the previous issue we saw Cyborg being reborn. His originally body had been infested by a sentient digital virus at some point, called Grid, and it joined the Crime Syndicate in the closing stages of the Trinity War (review), leaving Cyborg in shock and close to death. But now one of DC’s most visible POC characters is back with a huge bang and in the absence of the Justice League he needs some allies. And for someone like him, who better than the Metal Men, sentient robots each with a distinct personality of their own? Geoff tells most of this issue as a flashback to the origins of the Metal Men and their first fight, with the discussions between Cyborg and Dr. Magnus bookending the entire tale. This means that, like I said above, there is no plot progression at all for the main Forever Evil storyline and thus I was quite disappointed, but all the same, it was a really involved story that I really enjoyed. The Metal Men, given their personality quirks, make for some great characters and that really is their charm you see. The New 52 has primarily been characterised by the grim and gritty and dark for its two and a half years so far, and we are finally beginning to see things that are not so extreme. This issue is a fantastic example of that. The Metal Men as presented here are vibrant, joyous, and have a will to live and breathe the world. That’s their personality, their attitude. How could it have gone wrong? It doesn’t really. The Metal Men as presented here were pretty damn awesome. I loved them as characters and I would love to see them take an active role in Forever Evil and go up against the Crime Syndicate, particularly Grid. I suppose the entire point of Justice League within the framework of this event has been to flesh out the world created in the New 52, and to continue to introduce “new” characters such as the Doom Patrol or the Metal Men or anyone else for that matter. Its an approach that can be really iffy, as was the case last issue with the Doom Patrol, or it can be really good, as is the case with this issue. We shall see how it all eventually pans out once the event ends. There is another shakeup in the art team this time. Instead of Jesus Merino doing the assists with the art, we have Scott Hana, who handles the finishes along with Joe Prado while penciller Ivan Reis handles all the layouts. I really enjoyed the art this time around. The splash pages are pretty damn magnificent and so is the case with the rest of the issue too. The Metal Men are drawn extremely well and they are coloured and inked fantastically too. This is an issue where the art team, which includes Rod Reis on the colours and Dezi Sienty on the letters, really came together to deliver a really good-looking issue. Overall, I had more fun with this issue than I did with the last. It has a significantly better story and better art too. So well done to all those involved! More Justice League: #1-6, #7-12, #13-15, #22-23, #23.1, #23.2, #23.4, #24, #25, #26, #27. 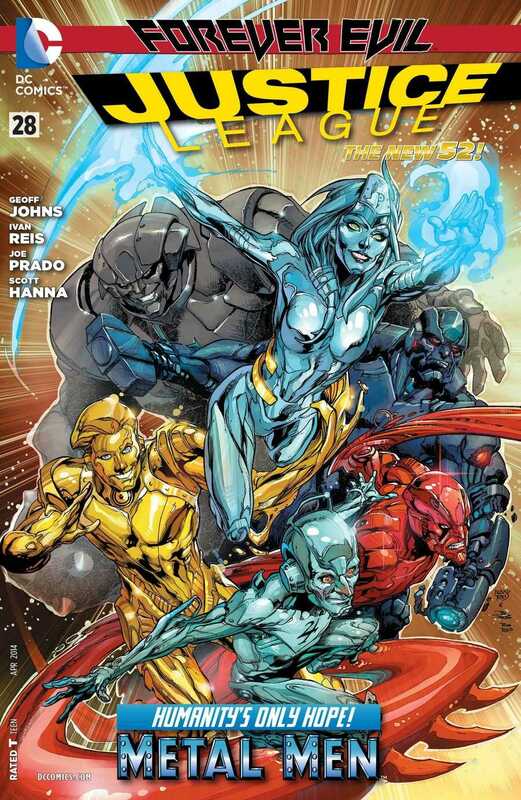 Posted on February 20, 2014, in Comics Reviews, Review Central and tagged Androids, Comics, Comics Review, Crime Syndicate, Crime Syndicate of America, Cyborg, Dezi Sienty, Dr. Magnus, Earth 3, Evil, Forever Evil, Geoff Johns, Ivan Reis, Joe Prado, Justice League, Metal Men, New 52, Review, Review Central, Robots, Rod Reis, Science Fiction, Scott Hana, Silver Age Heroes, Superheroes, Supervillains, Will Magnus. Bookmark the permalink. 7 Comments. Great review as always. Your reviews of the New 52 got me interested in reading comics again after a long layoff, so I just wanted to say thanks for all the great blogging. Take care. Thanks, much appreciated! And enjoy the reading!